Simbavati River Lodge offers an exclusive and authentic African Big 5 Safari experience over an extensive tract of pristine rich wilderness in the well-known Timbavati Private Nature Reserve, home to the famous white lions. Simbavati takes its name from the local Shangaan language, translated as “the place where the lions come down from the stars” and is set amongst a truly unique landscape with magnificent views over the Nhlaralumi River - a beautiful watercourse when rain is plentiful during the summer months, and a dry riverbed in the drier winter month. This intimate, family-friendly lodge boasts contemporary luxury accommodation in eight luxury safari tents and three family thatched chalets, all privately situated and comfortably furnished with en-suite facilities. Common areas include a generously proportioned lounge, bar, boma, private pool and extensive decks with breath-taking views overlooking the river where regular wildlife sightings take place and guests can unwind. The tented spa treatment rooms also offer indulgent massages and rituals for complete relaxation. The lodges focuses on excellent big 5 game viewing, breath-taking views, friendly and knowledgeable staff and an enriching safari experience all in an environment where guests and families are made to feel comfortable and relaxed from the moment they arrive. Game drives are conducted by an experienced field guide and Shangaan tracker in open 4X4 vehicles in the early morning and evening for exceptional game viewing when the animals are most active. Nocturnal animals, including the big cats are regular sightings at night. Simbavati also offers specialized photographic game drives. Breakfast and lunch are served daily outside on the wooden deck, set out under age-old Jackalberry and Leadwood trees, combining African and Western cuisine offering exciting new tastes for the more adventurous as well as for the more conventional preferences. A traditional dinner is served around the campfire in an open-air "Boma", an experience not to be missed. Tented accommodation offers generous bush or water views from your own private viewing deck, spaced adequately far apart to ensure privacy and comfort. 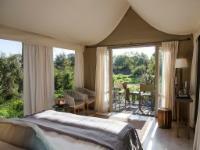 Simbavati River Lodge is a child-friendly safari camp with three family chalets. Two have two separate bedrooms sharing one bathroom, accommodating four persons. Simbavati River Lodge is a child-friendly safari camp with three family chalets. One has two separate bedrooms sharing one bathroom, accommodating five persons. Please do not arrive at the lodge late, as you will then miss the afternoon/evening game drive and lunch, which we do not serve later than 16h00.